As per the renders posted by a Dutch media outlet, the phone sports an almost edge-to-edge display, and no front camera. High-quality 3D renders of foldable phone leaked. The images show almost edge-to-edge display but no front camera. Last week, Samsung Vietnam’s YouTube page uploaded and quickly removed a video showing the company’s foldable display smartphone. Based on the video, Dutch website LetsGoDigital has prepared high-quality 3D renders of the phone, giving us a sneak peek of the design of the phone. The phone, which could be called the Galaxy Fold, is slated to launch sometime in the first half of this year but the company may make important announcements at the ‘Unpacked’ event in San Francisco on February 20. According to renders, the phone does not have a selfie camera. The renders show an almost edge-to-edge display in both folded and unfolded conditions. In the folded state, the display shows four icons aligned horizontally, and in the unfolded state, the number doubles up to eight icons stretched from left-to-right. The South Korean company showcased the phone at its annual developer’s conference. At that time, the phone was covered in a case to hide the design of the phone. Last month, Samsung announced a timeline for the launch of the foldable phone. 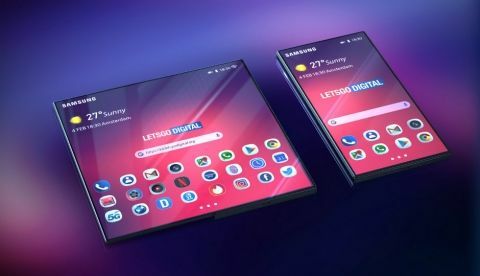 Samsung's Director of Product Strategy and Marketing confirmed in an interview that the foldable smartphone will launch in the first half of 2019. 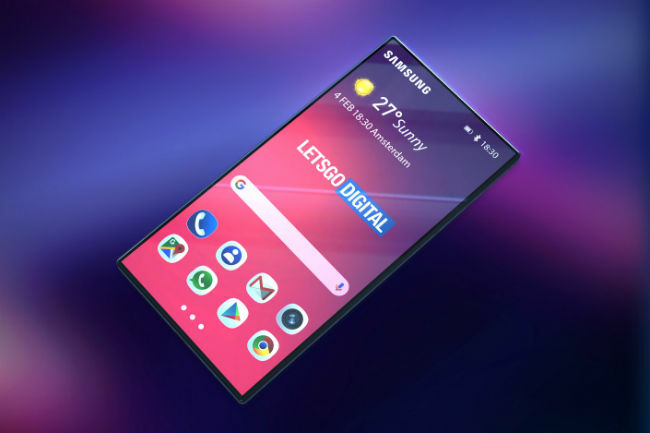 A few reports also suggested that Samsung may unveil its Galaxy F foldable phone on February 20, alongside the Galaxy S10 series of smartphones. Recently, the company put up some billboards in Paris with the words “The future unfolds” and “February twentieth” written on them. The phone is speculated to use an Infinity Flex Display which measures 7.3 inches. The display is said to offer a resolution of 1536 x 2152 pixels and an aspect ratio of 4.2:3 when it is in an unfolded state. In the folded state, the “cover display” measures 4.58 inch diagonally offering a resolution of 840 x 1960 pixels and an aspect ratio of 21:9. Samsung claimed that the phone can be folded up to fit into a pocket. According to DJ Koh, CEO of Samsung's Mobile Business Division, the initial stock of the foldable smartphone will be over one million units and if the market reaction is positive, the company can produce more. Google had also announced that it is now developing its Android software to support foldable devices, and it’s working closely with Samsung for the launch of this phone next year. “Now we see a Android device makers creating a new category: Foldables. Taking advantage of new flexible display technology, the screen can literally bend and fold,” Stephanie Cuthbertson, Director of Product Management at Google, had said.